Approaching Sunrise High Sierra Camp in Yosemite. Hike long enough in the Sierras and you inevitably notice the FedEx and UPS carriers of the mountain trails. There are around 16 commercial outfitters or packers in the Sierras. Most often, you will see evidence of their passing littering the trail. Initially, you complain about the smell and of the doodles, but then you realize that it’s just part of the experience hiking in one of the most amazing places ever. 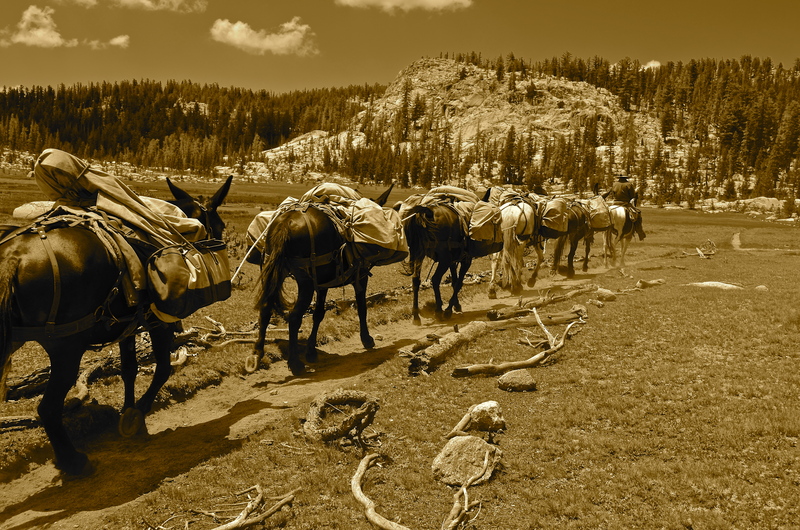 The pack or mule trains in the Sierra Nevada Mountains are the primary way of supplying the remote camps throughout the region. 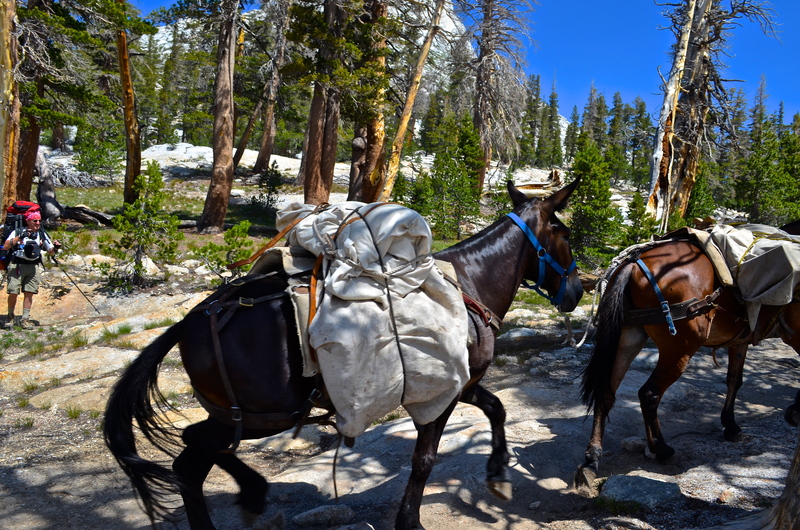 Thru-hikers on the JMT definitely appreciate the deliveries of their supplies to the Muir Trail Ranch. 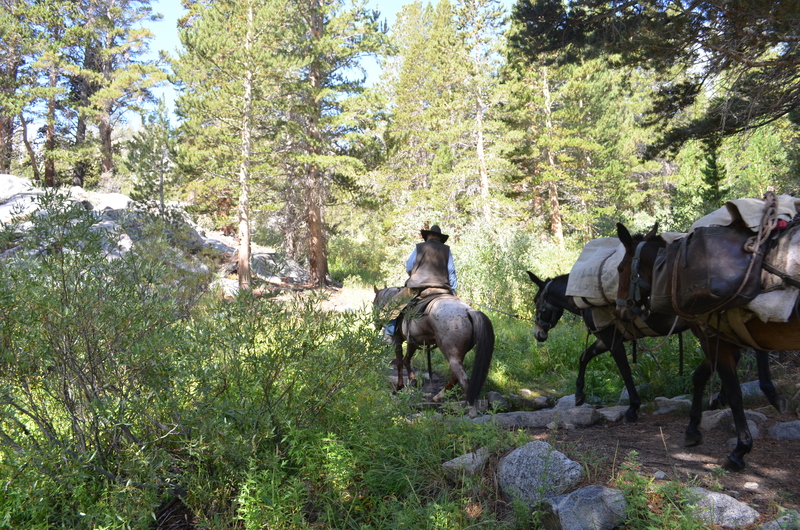 Without the mules, people would be exiting the trail for resupply or carrying much more weight. These sure-footed creatures usually weigh in around 600-800 lbs and can carry around 20% of their body weight. The trains are as short as four mules or big as ten. They are fairly docile and move along at a steady pace of 3-5 mph. As you may know, all mules are sterile, the result of a male donkey and a female horse. The scientific name of the species is Equus asinus x Equus caballus (donkey x horse). Quite the load you have there fella. 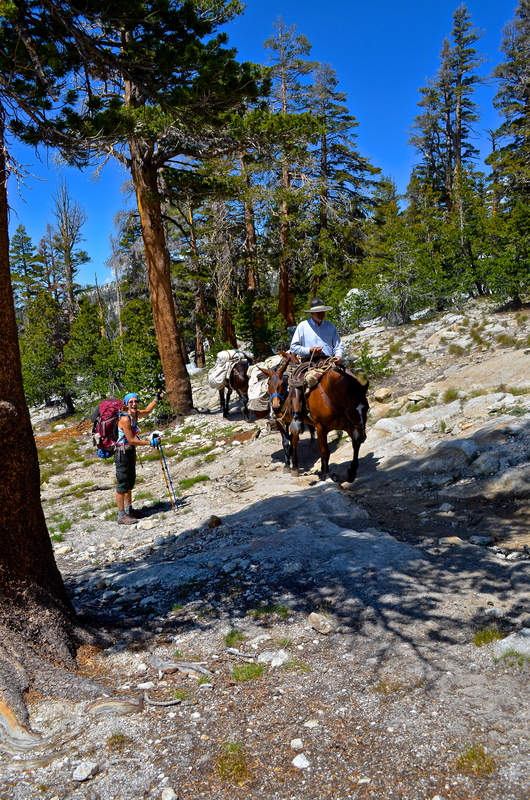 Our first encounter with pack mules was on the John Muir Trail. They were on their way to a High Sierra camp and were loaded down with supplies for the “glampers”. The train drivers are usually cowboy types and almost always friendly. Trail etiquette: Always give the pack trains the right of way. When you see them coming, find a safe area to stand or on the uphill side if you are on a narrow part of the trail. Generally, they are not skittish, but it’s best to be quiet. If you take pics, ensure your flash is off! Get your water upstream here. On the JMT in Yosemite. Each year around Memorial day, an event named Bishop Mule Days Celebration http://www.muledays.org/ is held to commemorate the impact that the mules have had in the Sierras. The town of Bishop, located on Highway 395 in the eastern Sierras puts on a spectacular event that showcases these hard working equines. Looks like fun. A passing train on the JMT. My wife off to the side. The pack trains of the Sierras. Yet another part of an awesome experience. “Another glorious Sierra day in which one seems to be dissolved and absorbed and sent pulsing onward we know not where. Life seems neither long nor short, and we take no more heed to save time or make haste than do the trees and stars. This is true freedom, a good practical sort of immortality.” John Muir – My First Summer in the Sierra (1911) chapter 2.